Secretary of State declares a new era as he presides over raising of American flag over reopened embassy in Havana. Secretary of State John Kerry was in Havana, Cuba, on Friday, as he presided over a ceremony raising the American flag over the newly reopened embassy, Reuters reports. 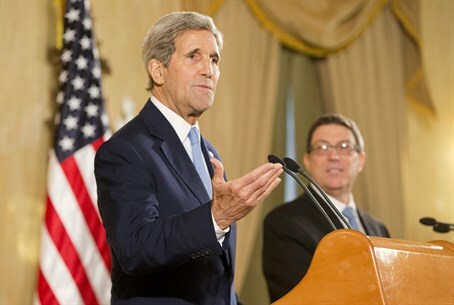 In a speech, Kerry declared a new era in relations between the United States and Cuba, but also urged political change in Cuba, telling Cubans they should be free to choose their own leaders. The event was another symbolic step in a path opened last December when President Barack Obama and President Raul Castro announced they would seek to restore diplomatic ties, reopen embassies and work to normalize ties. The move came after Havana released Jewish-American contractor Alan Gross in exchange for three Cubans held in the United States for spying. Kerry made plain that despite the historic opening between the Cold War-era foes, Washington would continue to push for democratic reform, according to Reuters. "We remain convinced the people of Cuba would be best served by a genuine democracy, where people are free to choose their leaders," Kerry said, speaking in a country where the Communist Party is the only legal political party, the media is tightly controlled, and political dissent is repressed. "We will continue to urge the Cuban government to fulfill its obligations under UN and Inter-American human rights covenants – obligations shared by the United States and every other country in the Americas," he stressed. His words were translated precisely into Spanish and broadcast live on Cuban state television. Kerry spoke on a podium outside the embassy, moments before U.S. Marines raised the American flag there for the first time in 54 years. As part of the move to normalize ties, the United States recently officially dropped Cuba from its blacklist as a state sponsor of terrorism, allowing the country to have better access to American banking facilities and aid, and meaning a ban on arms exports and sales is also lifted. Washington has also authorized commercial ferry services to Cuba for the first time in more than a half-century. Sen. Marco Rubio (R-FL), has vowed to oppose the confirmation of an ambassador unless “substantive progress is made” on human rights issues that have dogged Cuba for decades. While the president has power over establishing embassies, nominations for ambassador must go through a Senate confirmation vote. Tags:Cuba, John Kerry, Havana, Cuba-U.S.